COLD-FX is safe and effective for reducing symptoms associated with acute respiratory tract infections. 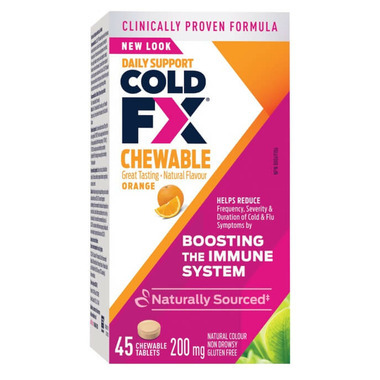 COLD-FX helps reduce overall symptoms of sore throat, runny nose, sneezing, nasal congestion, malaise, fever, headache, hoarseness, ear aches and cough. Suggested Use: Adults: Take 1-2 tablets, two times daily, up to 9 chewable tablets per day. Children 12 years of age and older: Take 1 chewable tablet two times daily. Caution: Individuals requiring anti-coagulant therapy such as warfarin should avoid use of this product. Do not use if pregnant or breastfeeding. Not recommended for individuals with impaired liver or renal functions. Consult a health care practitioner prior to use if you have diabetes. Do not exceed the recommended daily dose. As COLD-FX is a derivative of North American ginseng, individuals with known allergies to ginseng should avoid use of COLD-FX.